Guelph, ON. – One of the Ontario Hockey League’s top teams will be visiting the Sleeman Centre this Sunday to take on the surging Guelph Storm. This will be the third meeting between the two clubs this season, with the Sting claiming victories in both previous matchups. Sarnia Sting Sarnia’s 33 points trails only the Sault Ste. Marie Greyhounds’ 34 points as the Ontario Hockey League’s best record. After beating the Guelph Storm in the season opener and losing the following night to the Kitchener Rangers, the Sting put together an impressive stretch of games winning the next 14 straight. They eventually had that streak busted by the Kingston Frontenac’s and have yet to regain their stride since that lost. Coming into Saturday’s game, the Sting have registered one win in their last five games. The power play will be an important factor coming into Sunday’s game against the Guelph Storm. They currently rank 2nd in power play goals for and 2nd in power play percentage. The Storm’s ability to remain disciplined and stay out of the box could be a deciding factor in the game’s outcome. The Storm came into the weekend riding a three-game win streak and a dangerous offense. With impressive wins over North Bay and Sudbury last weekend, the Storm struggled against London and Kitchener this week. Look for them to come out strong on Sunday to try and gain back some ground missed. Sarnia’s power play units have been a lot for opposing teams to handle so far this season. Luckily for the storm, they have displayed an ability to not only stay out of the box, but be an effective penalty killing team when the opportunity arises. The team currently sits seventh in the league in penalty killing effectiveness. Neutralizing Sarnia’s high-powered offense will be an important task for the young team. Sunday’s game will feature a surplus of future NHL talent. A total of 12 players between the two rosters have been drafted into NHL, consisting of Guelph’s Liam Hawel (Dallas Stars), Nate Schnarr (Arizona Coyotes), Alexey Toropchenko (St. Louis Blues), Mark Shoemaker (San Jose Sharks), Isaac Ratcliffe (Philadelphia Flyers), Givani Smith (Detroit Red Wings) and Dmitri Samorukov (Edmonton Oilers) in addition to Sarnia’s Anthony Salinitri (Philadelphia Flyers), Drake Rymsha (Los Angeles Kings), Adam Ruzicka (Calgary Flames), Jordan Kyrou (St. Louis Blues), and Ryan McGregor (Toronto Maple Leafs). The Guelph Storm fans will be happy to have Givani Smith back on home ice for the first time this season. Smith has been sidelined with a high ankle sprain that he received at the Detroit Red Wings training camp this September. Smith made his season debut on Friday against the London Knights and was held of the scoresheet in a 7-4 loss. The Detroit Red Wings second round pick in 2016 finished off last season 26 goals and 44 points in 64 games placing him third on the team scoring list. 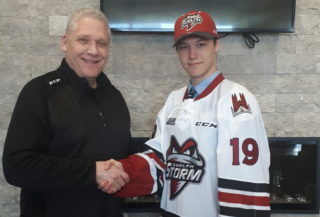 Once his timing gets back to normal, Smith will be an important part of the Guelph Storm’s lineup moving forward. 1st round pick Tag Bertuzzi also returns to the line up after time off from injury and his participation in the 2017 U-17 World Hockey Challenge. Ryan Merkley is coming off of an impressive week where he received OHL ‘On the Run’ Player of the Week honours as well as the Storm’s Player of the Week. Merkley scored once and added an assist as part of a 6-2 win over the North Bay on Friday and then followed that up by collecting a career-high four assists on Sunday as part of a 5-1 win over the Sudbury Wolves. It’s almost an understatement to list Jordan Kyrou as a Player to Watch in Sunday’s game. Kyrou is currently leading the league in scoring and is riding a 11-game point streak. Throughout his 11-game point streak, Kyrou has found the back of the net 13 times and added 16 assists. The 2016 second-round selection of the St. Louis Blues has been an exciting player to watch this year and will surely be a handful for the Storm defence core on Sunday. 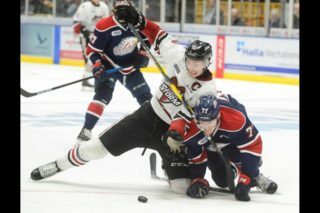 Sunday night’s contest against the Sarnia Sting can be heard live on the radio throughout the Guelph area on 1460 CJOY AM, online at www.cjoy.com or by downloading the CJOY app HERE. Additionally, the game will be televised live in Guelph on channel 22 / 510 (HD) for Rogers TV cable subscribers and throughout the province of Ontario on the OHL Action Pak on channel 439 for Rogers TV cable subscribers and 480 for Cogeco TV cable subscribers. Fans can also watch the game live online at www.ohllive.com or on the OHL Live app. 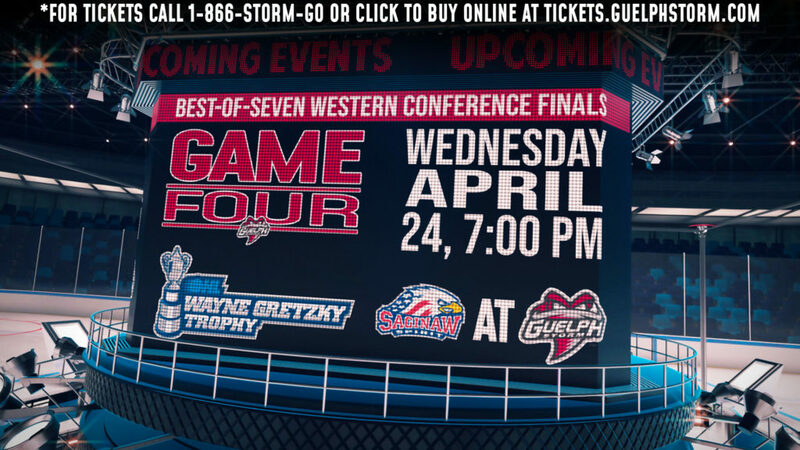 The Guelph Storm be at home twice next weekend. They will face-off against the Barrie Colts on Friday at 7:30 p.m. in the annual Pink the Rink game in support of the Canadian Cancer Society and sponsored by Skyjack and will follow that up with a game against the London Knights on Sunday afternoon with puck-drop coming at 2:00 p.m. 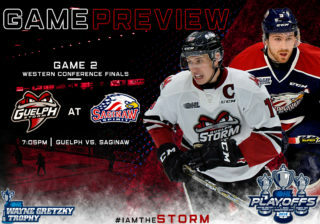 Fans can purchase tickets either in-person at the Sleeman Centre Box Office, Monday through Friday from 10 a.m. to 5 p.m., by calling (519) 837-9690 or online at ticketmaster.com here.